"She was one of the elite luxury liners of her day, known as the 'Millionaires' Ship' for all the wealthy and prominent figures she carried." Three years before Titanic, on January 24, 1909, another palatial and "unsinkable" White Star Line passenger liner sank 50 miles off the coast of Nantucket. The RMS Republic sank in the most treacherous part of the North Atlantic, a heavily trafficked shipping lane, in 270 feet of shark infested water. The ripples from her loss generated the greatest legend in lost-treasure lore, the loss of "wealth beyond most men's wildest dreams." 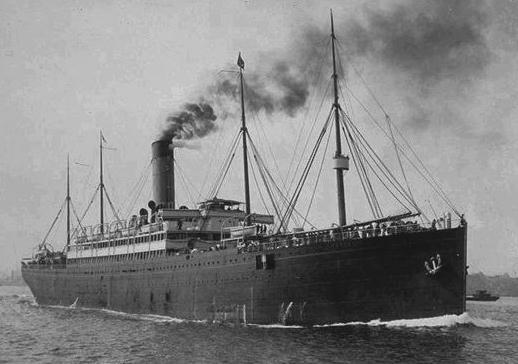 The Republic, a Royal Mail Ship (qualified to carry both the British and U.S. mails, hence her "RMS Republic" designation), one of the largest and most luxurious passenger liners of her era, flagship of the White Star Line steamship company's Boston-European Service and one of that line's most prized vessels, departed New York at 3 p.m., Friday, January 22, 1909, outbound to Mediterranean ports. In the early morning hours of January 23rd, 1909, in a dense fog, she collided with the in-bound immigrant ship SS Florida. The Florida struck the Republic almost a square blow port side abaft midships, at the Republic's engine room, knocking out her engines, boilers and dynamos. She lost all power, motive, electrical, and steam. However, she did have some secondary battery power for the use of her just-recently installed wireless telegraph. Six persons (3 Republic passengers and 3 Florida crew members) were killed as a direct result of the collision, but over 1,500 passengers and crew were rescued. The survivors attributed their deliverance to the steamship company's prompt use of the recently invented Marconi wireless telegraph to call for assistance. Within minutes of the collision, the Republic's Marconiman sent the "CQD" ("CQ" = "[Attention] All Stations," "D" = "Distress"), the predecessor to today's "SOS" distress signal, over the airwaves to the world at large. No less than seven ships, including several major liners, responded. This was the first practical demonstration of this "new" technology's ability to aid victims of disasters at sea - and this "miracle" captured the world's attention. It was the world's first "breaking-news" "live" mass-media event. The Republic's passengers were transferred twice, first to the less damaged Florida, then to the called-to-the-rescue White Star liner Baltic. This double-transfer open-sea rescue maneuver remains the largest on record. The Republic's passengers were transferred to other vessels primarily out of concern for their comfort (from the heatless, lightless Republic), with some concern for their safety (the "unsinkable" Republic's water-tight bulkheads were under a severe test, and, because she could not maneuver, with the fog, she might be hit by yet another vessel in the busy shipping lane). Ultimately, however, the Republic's bulkheads did not hold. The next day, while under tow back to New York, she sank in deep and shark-infested waters 50 miles south of Nantucket Island - beyond the grasp of that era's technology to recover. She was the largest, most technologically advanced vessel to sink in history to her day; she was succeeded in that ignominious role only by the loss of another virtually unsinkable White Star Liner, Titanic, which was to sink just three years later. The Republic's cargos, however, did not fare as well as her passengers. All baggage and other cargos were lost. After all, there was no need to remove cargo from an "unsinkable" ship. And there was also no power to operate her winches, and no time; passengers always came first. Irrepressible rumors from that date and which continue to this day - forming the greatest legend in lost-treasure lore - suggest that, in addition to a $500,000 US Navy Payroll (consigned to the U.S. Navy Atlantic Fleet at Gibraltar, 1909 value, worth today perhaps seventy million dollars), thousands of dollars in relief monies destined to aid the survivors of an earthquake in Italy, and the hundreds of thousands of dollars of personal jewelry and other valuables of her wealthy passengers (all 1909 values), she also carried to the bottom of the sea a politically sensitive and secret shipment of gold that had been consigned to the Tsar of Russia: a $3,000,000 (1909 face-value) five-ton shipment of mint condition American Gold Eagle coins. The required legal inquiry concerning Republic's loss was never held. That lack of public scrutiny of the events surrounding her loss directly precipitated White Star Line's 1912 Titanic disaster. At the time of Republic's loss, the newspapers had raised serious questions regarding a ship's speed under adverse conditions, bulkhead construction, wireless telegraphy (monitoring, effectiveness and proximity of rescue vessels), and adequacy of lifeboats and lifesaving equipment. Certainly these questions would have been addressed in the official inquiry concerning the Republic's loss - if one had been held. The loss of 1,500 lives on Titanic was the cost of inaction, a crime of omission. But why was the official inquiry never held? Winston Churchill, then President of the British Board of Trade, the agency responsible for conducting the Inquiry, would have known. Others in power at the time would have known as well. No doubt, Theodore Roosevelt, President, would have known. And Franklin Delano Roosevelt, Acting Secretary of the Navy, would have known. Could it be that the Republic does indeed carry a cargo that may be worth today as much as five billion dollars, a cargo if its loss had been revealed at the time would have caused public panic in the world financial markets and jeopardized the very existence of the Government of the Tsar of Russia - and placed the world into war? Captain Martin Bayerle located the Republic in 1981. He has devoted the past 30 years to the study and research of events surrounding her loss. His efforts are now compiled in on the official RMS Republic website (www.RMS-Republic.com) and in his newly released book, "The Tsar's Treasure." Sections include background, research, newspaper information, theories, export-import studies, verification and miscellaneous tables and graphs. The matter of "gold engagements" (the manner in which gold was secured and shipped in that day) is analyzed in great depth and documents from the U.S., Great Britain, France, Russia, Spain and Switzerland have been examined for their relevance. In addition, an exhaustive search of all newspaper, company and public records has been completed in order to facilitate a book and film documenting the story of the Republic. Congratulations, you have just stumbled upon a true treasure of its own. Please enjoy participating in the greatest treasure story ever told!